I know you are all busy people on a Sunday, so just a quick post to see you through the Queen’s Diamond Jubilee festivities. Along with yesterday’s two White Chocolate Treats (one with freeze-dried strawberries and the other with rose water) we will be mainly munching on these Chocolate-covered Strawberries. The kick? Once again, I give you Sichuan peppers. Before you think I have gone completely off my rocker, in my defence I should say that black pepper and strawberries is a fairly popular pairing (three and a half million Google entries can’t be wrong). As is balsamic vinegar (yum), as is shortcake (meh, unless homemade). But I love these aromatic, electric berries and just thought, why not. If they didn’t work I wouldn’t be bragging about it, and certainly wouldn’t waste your time with it. I would just quietly eat them and make something less likely to have you click away immediately to a pretty cake or a gooey traybake. But they have the food to glow family seal of approval, Miss R and Mr A being a discerning bunch who call a spade a spade, and a horrendous disaster a horrendous disaster. I hope they get your approval too. Just to warn you: yet another Sichaun pepper containing recipe (adaptable of course) coming your way soon. But with actual Chinese (-style) food this time. No, really. Not with rhubarb. I kid you not. Well, I’m off to watch the Queen’s Jubilee 1000-boat flotilla from the comfort of my sofa, cup of tea in hand and assorted food to glow snacks at the ready. Have a great rest of the weekend, and a Happy Jubilee to you, too. Back to my savoury self soon. Not the most conventional of toppings, but a nice one nonetheless. I love the contrast of the sweet-tart of the berries, the bittersweet of the chocolate and the ba-da-boom of the Sichuan. Just a little something different to keep everyone on their toes this Jubilee. Wash the strawberries and pat dry with a kitchen towel or two. 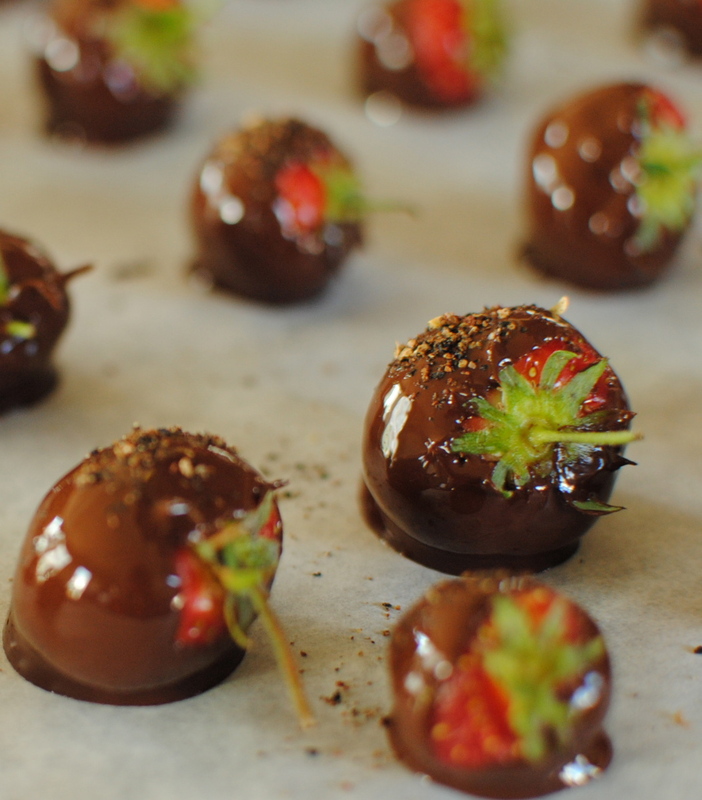 They need to be completely dry or any moisture left on the berries will cause the melted chocolate to go grainy and weird. Eww. To melt the chocolate use either a double boiler or the microwave. For the double boiler either use a proper double boiler, or use a glass or stainless steel bowl, and set the pan/bowl over a pot of just simmering water. 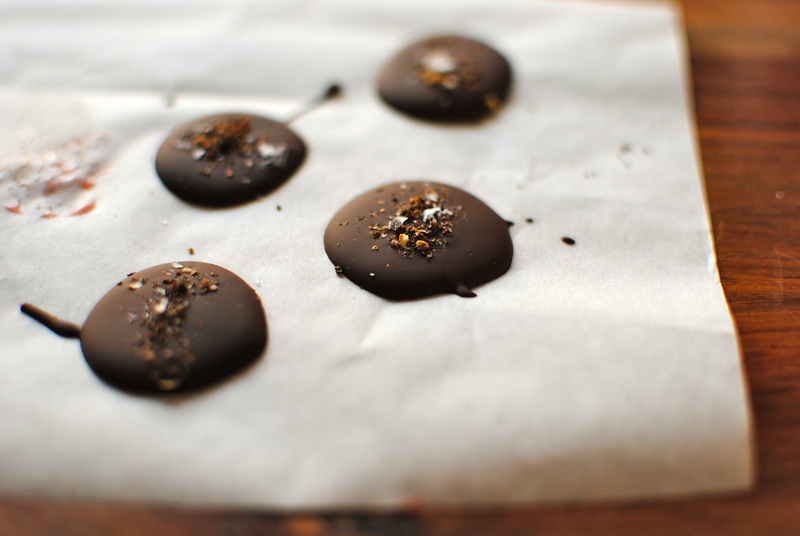 Be very careful that no water or steam droplets get in the chocolate. Let the chocolate sit until it is mostly melted before removing from the bottom pan. Wipe the bottom dry (so to speak) so no condensation is tempted in get in. Whisk until glossy. If it is at all cranky whisk in a little oil or butter and whisk again. For the microwave, pop the chopped chocolate into a suitable bowl and melt partially for one minute on the lowest setting (defrost or 10 per cent). Check the chocolate and stir well. If it needs more time do it in short 10 second bursts, checking and stirring each time. Let the residual heat melt any small pieces of chocolate. Chocolate chips and baker’s chocolate may not look melted until you stir it, so always stir at each heat blast. For the dipping, take a strawberry by the stem, or if not a long enough stem then spear carefully with a toothpick at the stem end, and gently swirl in the chocolate. Give it a twist with your fingers as you withdraw from the chocolate. Twirl it in a circle once it is out to let the excess chocolate drip off. 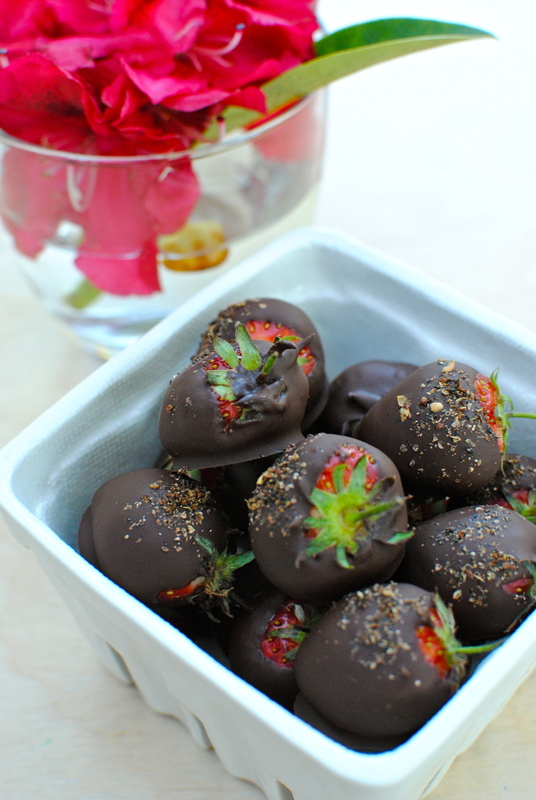 Lay the strawberry on a parchment paper-covered tray and carry on with the remaining berries. 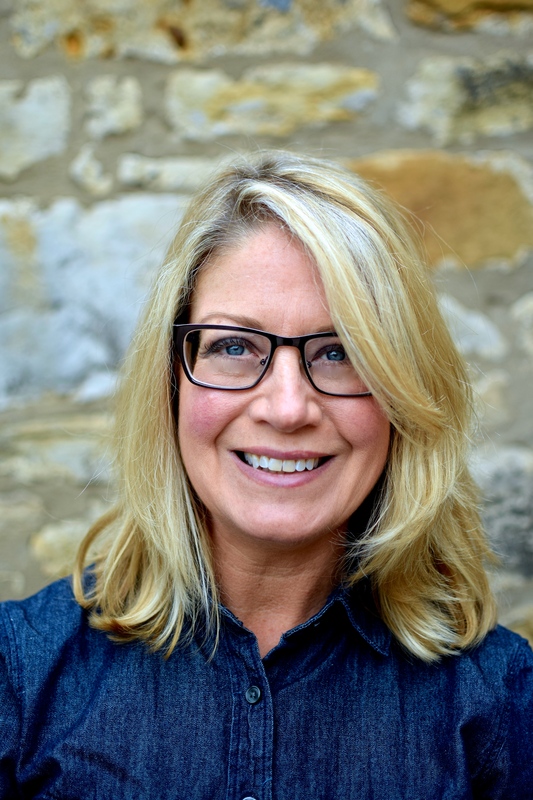 PS If you want to temper the chocolate like a pro (or if you want to keep them for awhile without them ‘blooming’) have a look at this website for all the pernickety details. Because I made a small amount for immediate consumption (and because I really could not be bothered) I just stuck with the unshiny, untempered version. Tastes jolly lovely though! Beautiful berries! I love how you got the chocolate all the way up to the top. Yummy combination! But of course my fingers were covered too! These look lovely – and what a great idea to use Sichuan peppers. I love the way they numb the tongue, and compliment hot chilies, but I never thought to pair them with something sweet. Thanks for the inspiration. I love them too so I just thought a little laterally and got lucky. How’s that for alliteration? Coincidental contiguous consonants … what are the odds? I like your style, Jean Francois. One doesn’t often come across the word contiguous. Unless one was once a mathematician … seems I can’t escape my past. Those cookies sound smashing – mmm! 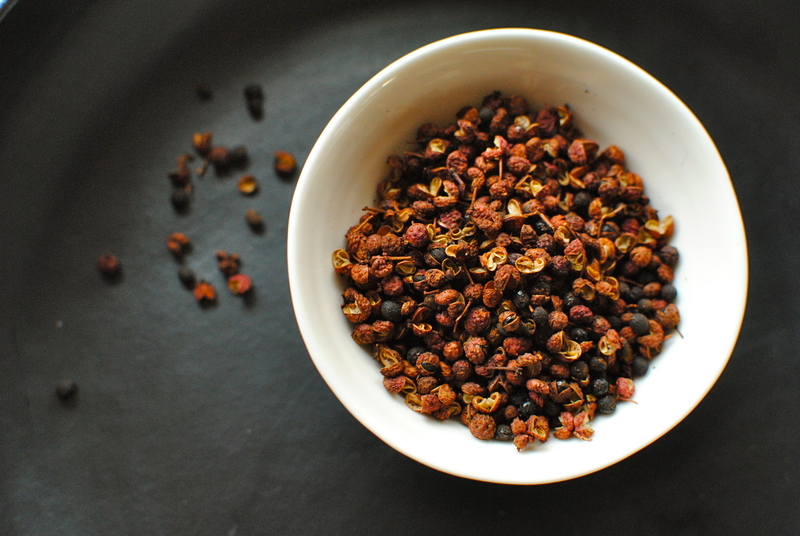 The Sichuan peppers aren’t hot, just super aromatic, citrussy and, best of all, tingly. Chili and chocolate are actually quite popular here but adding the strawberry is very interesting, maybe come strawberry season (which is just days away I can hardly wait) we will try this in our home. I hope you try them but only if you already have the Sichuan peppers. I mainly appreciate strawberries as is but this is a really more-ish titivation. PS I like your new gravatar – very glam! We are in the midst of our strawberry season and enjoying the berries every way possible. 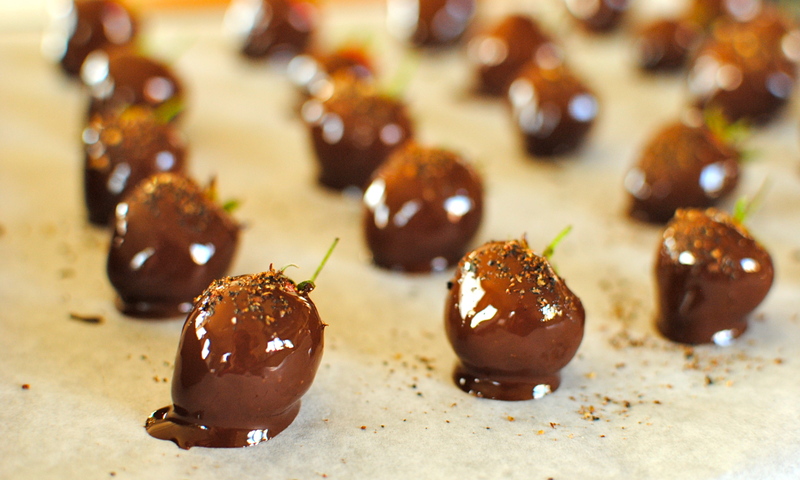 I have not tried Sichuan pepper with chocolate and strawberries but am intrigued by your recipe. Another great temptation! I don’t think you’d be disappointed! Strawberry season makes me very happy. And next it’s raspberry season. Are raspberries grown near you? I am browsing your blog every now and then and we just made something really similar the other week with my four-year old son. He just loved it. No, it´s without Sichuan. Personally, I would have liked to try but our son is opposed to all flavours more exotic than tomato sauce and a little bit of salt. 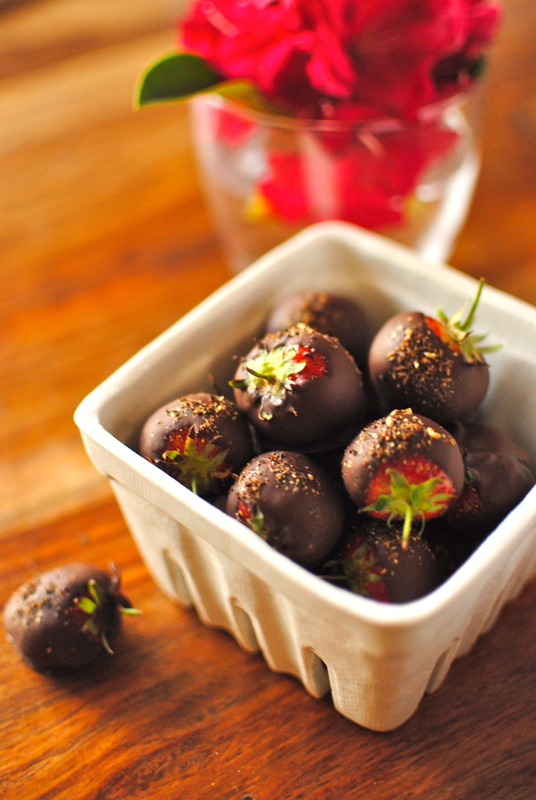 And chocolate with strawberry seems to come right away from paradise to him…. Anyway, he loves to cook and bake and thats a really nice thing to do with him. With or without exotic spices. We´ll have a go for them a little bit later because our adult food is always super spicy. But there are a lot of strawberry-chili-chocolates here in Germany, so the combination is well known. ANd your strawberries look awfully good! I’m not sure where you are from but if you are in the Uk Steenberg’s (online and in nice delis) has a really fab powder (it is in my brown butter cottage cheese pancakes and a pic of it) and Neilsen Massey do a paste, available at Lakeland and, other fine retailers; Waitrose stocks Taylor and Colledge brand. Both the powder and paste are great in non-cooked foods as there is no alcohol to taint the flavour. With everything going on last weekend I totally missed these! They look stunning. I do love the idea of the pepper. Yummmm.